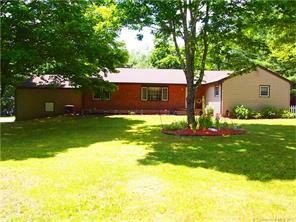 Gorgeous Four Bedroom, Two Bath home in a fantastic Windham neighborhood. Open floor plan with beautiful hardwood floors through out, large bedrooms with plenty of closet space, Central air, Central Vac, a front covered porch and a covered rear deck with built in lighting. This home is great for entertaining featuring an open kitchen with granite counters, large pantry, and breakfast bar open to the wide open living space with fireplace and sliding glass doors overlooking the well maintained back yard. The large 2 car attached garage has high 12 ft ceilings and a workbench. Updated windows, new driveway, and new hot water heater are just a few of the bonuses. Full unfinished basement has a tremendous amount of space for endless possibilities and includes a pellet stove to keep the fuel costs down. Come see this property for yourself!